Hi friends .....feels good to be back to blogland after a sabbatical. I had my favorite aunt and niece staying with me for a couple of weeks and I was soooo busy with them that I didn't have time to craft or go online to visit my blogger pals! And I am so flattered and touched that many of you tried to get in touch with me to ask if all was well...crafty pals are the best!! Mwah! If you are in need of a crafty fix but can't be bothered to create something from scratch,I highly recommend altering something you have at home! 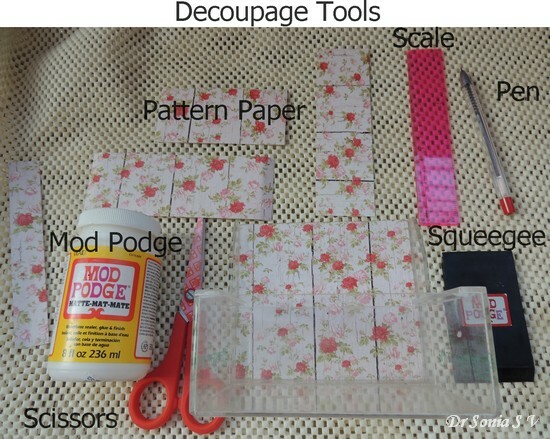 And if you want to feel crafty while you are about it...try decoupage!! 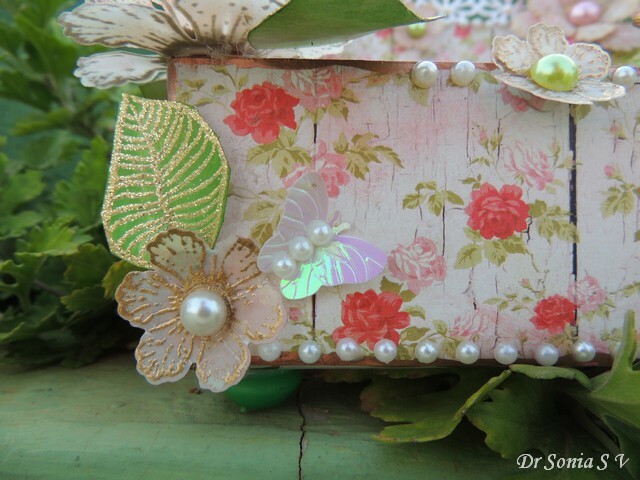 And some golden stamped leaves and butterflies and pearls! 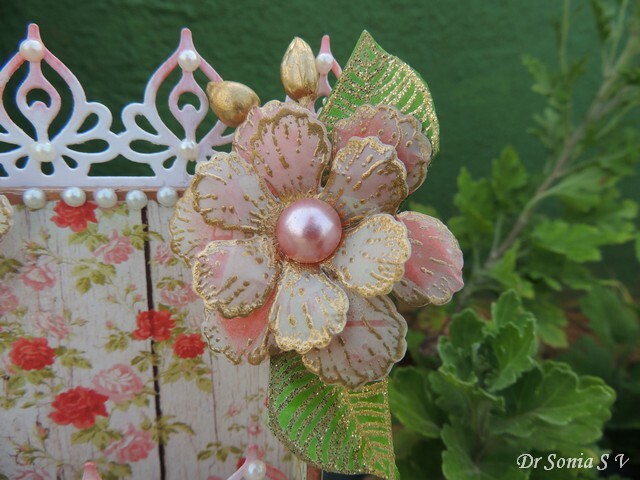 Decoupaging is an age old craft and easy and tricky at the same time!It is one paper crafting technique which can frustrate if you are a bit sloppy and which can give such a profound sense of gratification when you get a crease less, smudge free beautiful project!! 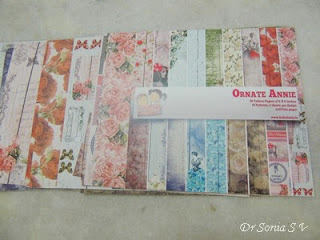 Sharing a few Crafty Tips I have picked up over the years ...hope they will help you have a blissful time decoupaging! Crafty Tip 1 - As in any craft the luxury of having the right products and tools makes decoupaging easier , fun and gratifying!! Squeegee- I have used a different type of plastic squeegee in my Sospeso Trasparente projects which is rather nice but totally in love with the squeegee in the Mod podge kit because of its rubbery nature and wedge spage at its ends which allows one to reach awkward nooks and corners like I will show in the subsequent pictures. An alternate is an old plastic credit card but the squeegee is much much superior!! Measure your project and cut pattern paper to line it. Crafty Tip 2 : Spend some time on measuring and cutting the paper to size as if you glue on even a few millimetres extra it increase your work later on as you will need to trim it and sand it! 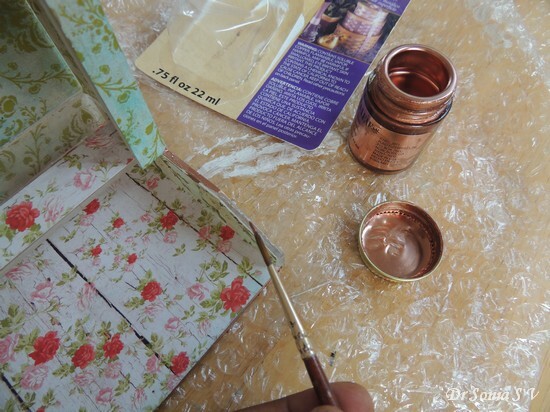 Crafty Tip 3: Plastic is not the easiest of materials to decoupage on as its slippery and your paper can just slide off and leave you frustrated! !If your plastic is super smooth ,sand it to give it a grip . 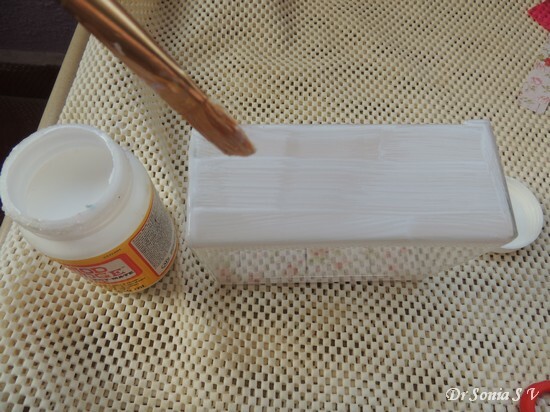 Crafty Tip 4: Apply decoupage glue uniformly using a sponge brush or a paintbrush [ the paintbrush I am using is part of the Plaid Decoupage Kit]. 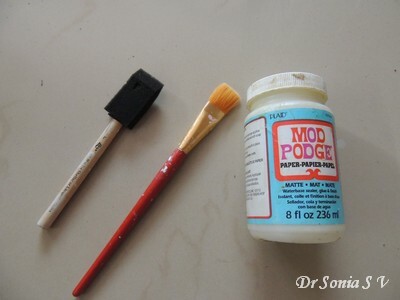 A sponge brush may be easier for beginners but I personally hate the glue wastage as the sponge soaks up precious mod podge and its more difficult to clean it to reuse! 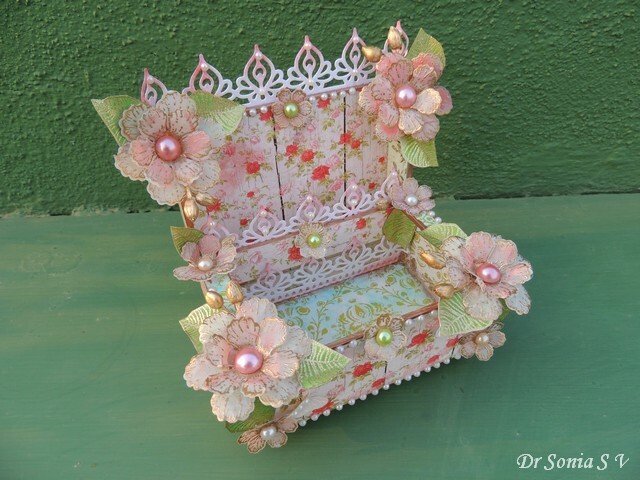 Crafty Tip 5:If your paper is thick you will get best result if you slightly mist it with water or even apply a thin coat of decoupage glue on it too before sticking it to your decoupage surface. 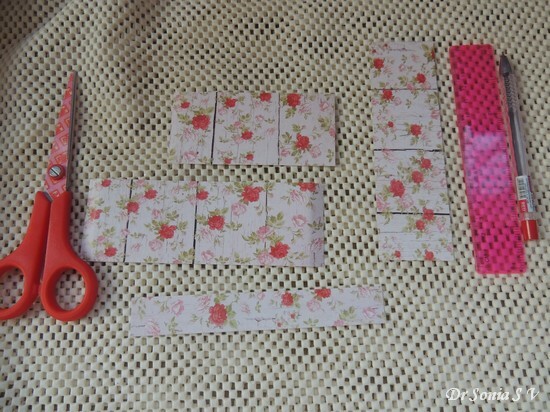 Crafty Tip 6: Dont apply too much glue on your surface as it will just wrap and wrinkle your paper later on. 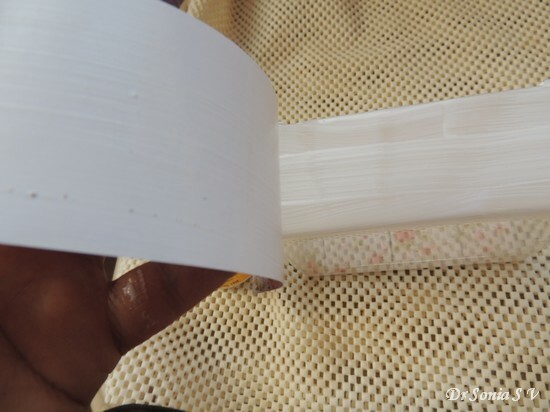 Crafty Tip 7: Start sticking your paper from the shorter end ....that is if you have a rectangle of paper as shown below.... start sticking from the short side...this way you have more control and are less likely to get wrinkles on your paper. You can actually use the edge of your hand for this but the the best tool I have found for this is the Squeegee. 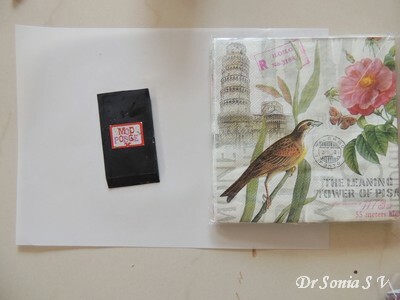 You can alternately use a brayer[ used in stamping],an old credit card or plastic scale. Use thesqueegee to firmly but gently [ too much force and you will slide your paper off the project!] slide over your paper and the excess glue will come out from the edge of the paper at the end and you can simply wipe it off. Using the squeegee you can easily slide into corners which are otherwise difficult to reach as you can see in the picture below. Crafty Tip 9: If you want to ensure a totally clean, smudge and glue stain free decoupaged surface put wax paper or parchment paper over the paper you have stuck before sliding your fingers,brayer or squeegee over it. This extra step is highly recommended when working with delicate tissue paper or light colored pattern paper. 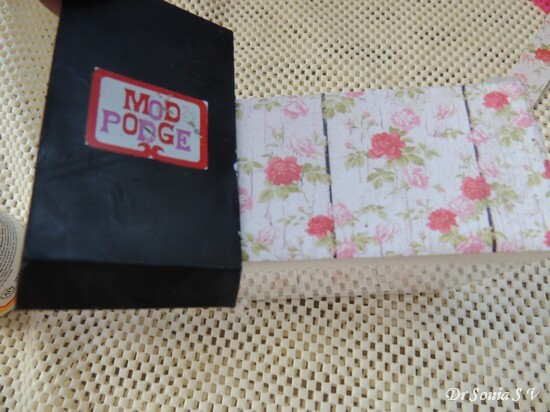 Crafty Tip 10 : WAIT and WAIT before you apply your top coat of modpodge as if you are impatient...your paper will crinkle and wrinkle and even slide right off your project! There is no fixed time as it will depend on the thickness of your decoupage paper and the climate...the best bet is to wait at least an hour or so! You can apply 2-3 top coats allowing enough drying time in between coats. Crafty Tip 12 : Don't hesitate to use Paints and Inks. 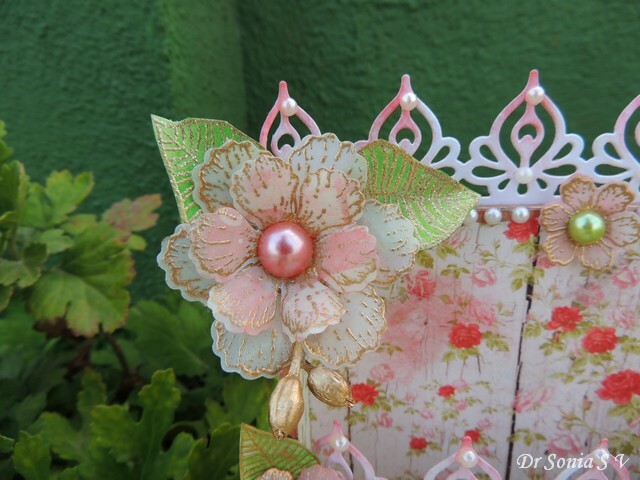 Sponging the decoupaged paper with distress inks can help tone a project down and you can use the same shades of ink to sponge other embellishments you later add to create a uniformity to your project. 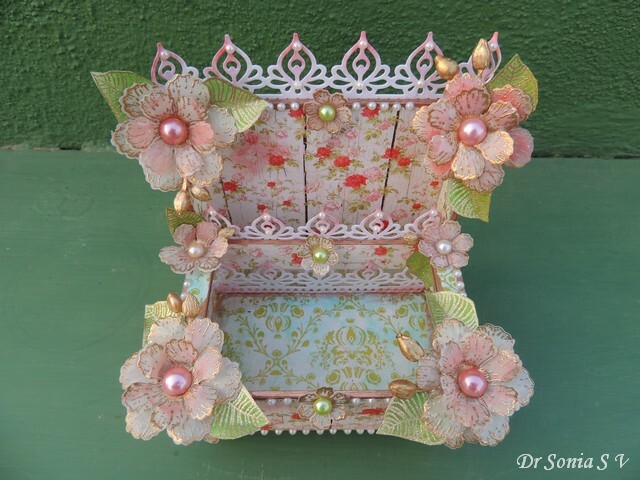 Here I sponged my parchment flowers, Spellbinders lacy borders and areas of the decoupaged pattern paper using the same shade of Distress Ink. 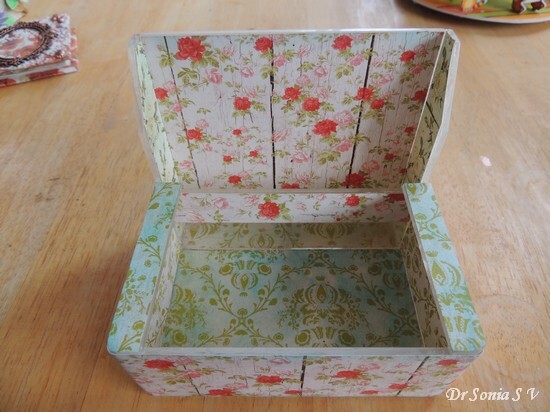 The edges of a decoupaged project may at times be tricky and time consuming to decoupage.In the picture above you can see the uncovered plastic edges on the container. 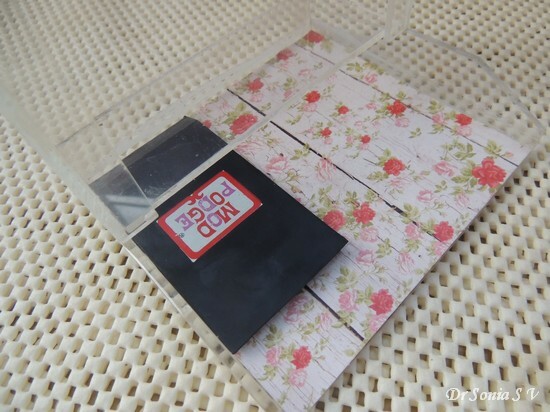 In such cases you can go about it the hard way by cutting thin strips of paper to decoupage those areas or opt for an easier and prettier option by just painting those thin edges and corners! 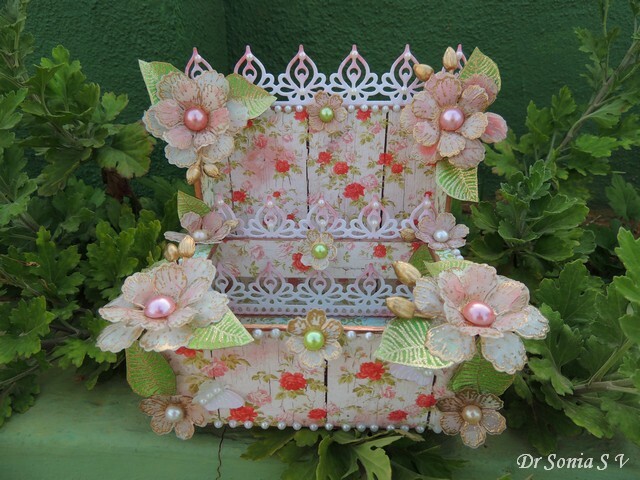 I used a beautiful product by Plaid called Liquid Leaf to paint the edges of my decoupaged project metallic copper. 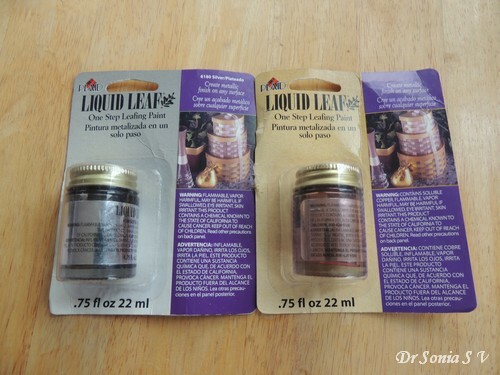 I love the thin fluid consistency of Liquid Leaf which made it super easy to quickly paint the thin edges of my plastic container! And here is the final altered project. 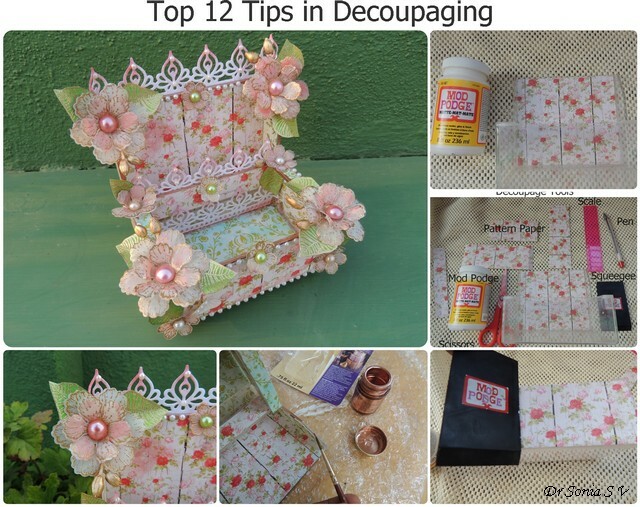 I hope some of these crafty tips on decoupaging were useful to you...do add your own tips in the comments. And dear blogger pals I will get around to visiting you this week!! I sure do have a lot of catching up to do!